USA Wildwater Team Trials and National Championships concluded today with the crowning of the 2003-2004 National Champions and the selection of the USA Wildwater World Cup Team. 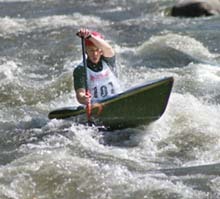 Today, the second of two days of racing, was two runs of a technically and physically demanding sprint course through "Ewings" a short, steep drop followed by about 2 minutes of easy moving water. Ewings required good boat placement and speed to run it fast and clean. The very long slow moving water to finish required good strength and endurance and the ability to dig deep as the lactic kicked in. Of note was the very tight men's K1 race. Andrew McEwan multiple National Champion and the fastest K1 in the country duked it out with slalom super kid Eric Giddens in this event that would clearly favor a slalom paddlers' training routine. After the first run McEwan had a slim 0.2 second lead over Giddens and clearly needed to ramp it up in round two. In third position, reigning National Champion Chris Hipgrave led another tight race for the other top positions over Simon Beardmore and Middy Tilghman. McEwan powered through round two and really showed just how much faster he had become since moving to the Bay Area of California to train full time, to finish nearly 2.5 seconds ahead of Giddens for a solid victory. 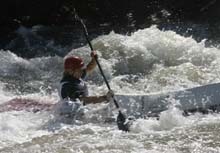 So with the sprint racing complete, the percentages from yesterday's classic race was added to today's sprint race numbers to select the National Champions and the USA Wildwater Team that will stay in Kernville California to represent the USA in next weeks Wildwater World Cups, the pinnacle of the international racing calandar. Congratulations to our new champions and good luck and speed to Team USA. 2003 National K-1 Champion Andrew McEwan blitzes a big hole. Photo ©2003 Mike Edmonson. 2003 National Champion Rebecca Giddens plows through the Kern Valley. Photo ©2003 Mike Edmonson. National C-1 Champion Tom Weir shows his crisp western form. Photo ©2003 Mike Edmonson. 2003 National C-2 Champions Russell and Reid Bailey take it downstream. Photo ©2003 Mike Edmonson.